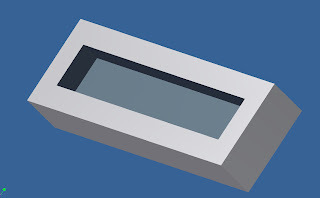 The elves at Autodesk Labs gave us a gift a little early this year (actually, it's been out for a few weeks), but for all of those who want to add custom profiles to Frame Generator, here's your tool! 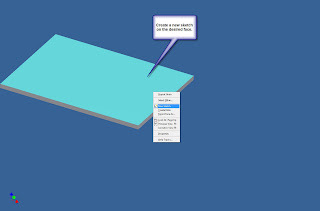 Go to www.labs.autodesk.com, and check under the utilities page! Well, I just ran into my first 'HUH?' feature in Windows Vista. 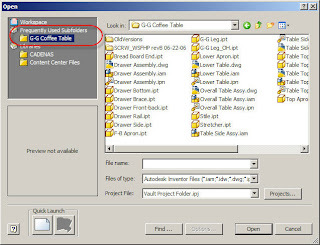 I was opening an Inventor assembly file, and got a 'No Error Message Available' message and the Inventor. Now, I did think that maybe my files had been corrupted, that could happen. However, when I copied all the files to a Windows XP box, I didn't get the error! At this point, I'm not sure what's caused the error (in Vista's defense, it may be something totally different). But keep an eye out. This one could be hiding out there! I'll repost if I find something out on this strange one. Once again, I'm afraid that I haven't been good about blogging recently. But my evenings have been filled with much frustration and blue language as I've been setting up my new laptop..... Which uses Windows Vista (Insert 'Psycho' theme here). That's right! Instead of playing it safe in the comfy world of XP, I decided to go for broke and get the new OS! That's right fellow geeks! You can't stop me! I'm a man on the edge! So far, it's been a bit of a challenge. My Inventor went in pretty easily, but my Autodesk Data Management Server install was quite a struggle. I had some problems with Port 80, which for some reason, wouldn't pass the prechecks. I solved them by unplugging my network cable. Why that worked, I don't know. But here's my honest assessment, after about 12 hours of 'real' use. I like the look and feel. The 'cool' factor is definitely high, and I'm slowly getting used to the different layout of the OS. Some of the networking is still driving me bonkers. I haven't figured out how to get it to talk to my XP boxes yet. I'm not sure if this is user error, or something in the OS, but for the moment, I've moved everything from one laptop to another using 'sneaker-net' (aka portable hard drive). You're only going to get 2008. I have my old reliable XP desktop for R11 and previous. And don't forget! 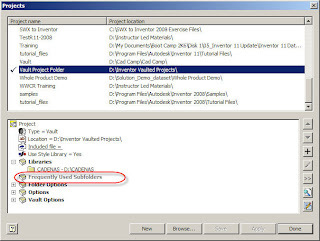 You have to install SP1 for R2008 for Inventor to work properly! Aside from that, Inventor seems to be moving along without any issues that I've noticed, but I'll be keeping track! In summary, if I were on a true production (making drawings all day) box, I'd probably wait a little longer before switching to Vista. But, since I'm pretty much pushing the envelope, I figured I'd go ahead and try Vista out. Wish me luck! Something tells me that things are going to get a little more adventurous. No Inventor post today, I'm afraid. I do have something in mind, I just haven't had a chance to post it yet. But I did want to wish the world a Happy Thanksgiving! Next stop for me! Las Vegas, Nevada, and Autodesk University! For those of you who attended the webinar I posted (Thank you again, by the way! ), I promised to post up the sheet metal book with the ISBN number one of the attendees was kind enough to share (thank you, I'm sorry, but I don't remember who it was!). Here's a link to the book on Amazon.com here. It doesn't look like there's been an update, but the basics are the same, and I've always personally, like the material that Travis Jones and Neil Munro have created (I've been fortunate enough to watch them both present at different times). I hope everyone finds this helpful! It's on its way now. Only a little time to Autodesk University. I put up this counter to keep track. I hope to see a few friends there! As usual, it's been a busy time here at U.S. CAD, but I finally found a few minutes to post a little tip. 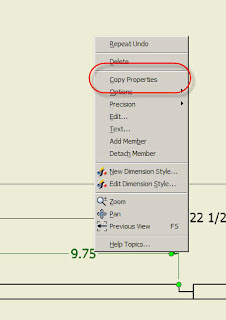 One of the features that sometimes gets missed is 'Copy Properties'. 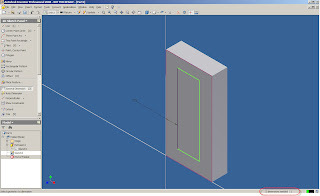 It works a little like 'Match Properties' in AutoCAD. 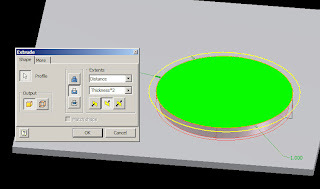 In my example here, I'm going to change the circle dimensions to match the '9.75' dimensions. In effect, we'll be matching dimension styles. 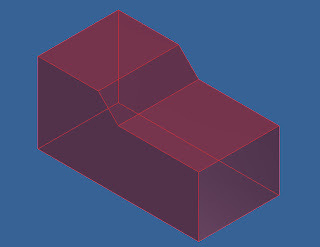 Step 1: Right click on the dimension who's properties you want to copy (the 9.75 in this case). Step 2: Now just choose the dimensions that you want to match the first, and you're finished! That's it. As simple as that! You just have to know where to look. Who's the emboss around here. 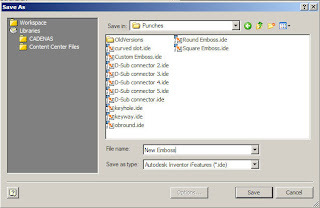 As promised to everyone who came out to the Southern California CAD Summit, here's how I created the emboss punch in Inventor 2008. 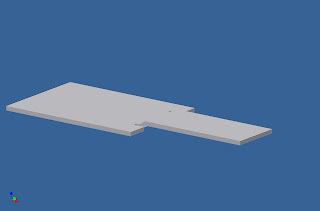 I created a flat piece of metal in Inventor's Sheet Metal tool. This serves as a 'generator' for my I-feature. I like to create parts who live only to create I-features for me. It allows me to go back and try again if I make a mistake the first time. Make sure you use a Point, Center Point in your sketch or the punch won't work! Next I draw my 'Footprint' for my punch. In this example, this is also going to be the simplified representation for my punch. 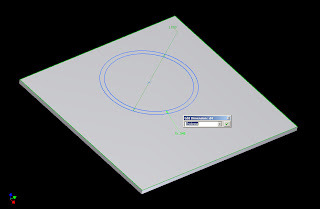 You'll also note that I set the circle's offset to be equal to the material thickness. This will allow the emboss thickness to adjust to different sheet metal thicknesses. 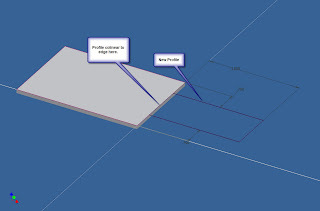 I'm going to use Inventor standard modeling tools to create my emboss, so I'm going to go to the Convert pulldown and switch to the Modeling environment. With this done, I can now start embossing the outer portion of my emboss. In my example, I've made the emboss's depth 3 times the material thickness, with a taper angle of 15 degrees. Of course your values may be different! I've colored the partially completed punch blue in this picture. Now we need to 'hollow out' the emboss. 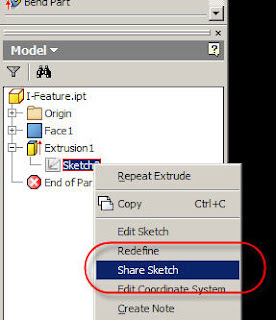 I'm going to reuse the sketch I created back in Step 2, but first I need to use the 'Share Sketch' tool so I can access it for the next step. 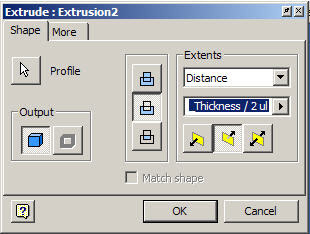 With the sketch available again, I can use the extrude tool to cut out the emboss. I use the same settings, but only cut 2 times the material thickness for the cut (so we don't cut out the bottom of our emboss). With the Emboss nearly completed, we can break the sharp edges with the fillet tool. Notice that I used the Thickness parameter again to keep my emboss thickness consistent. With this completed, I renamed my sketch to 'Footprint Sketch'. This isn't absolutely necessary, but it helps find the sketch when we need again a little later. 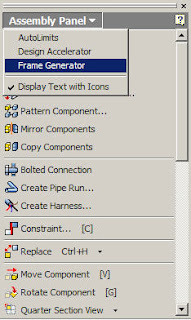 Finally, we get to go to Tools>Extract I-feature and create the I-feature! 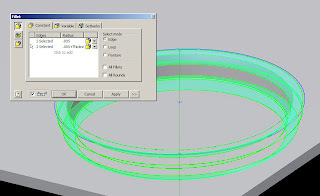 a) I added the diameter as one of my size parameters (so I can change the diameter of my emboss). 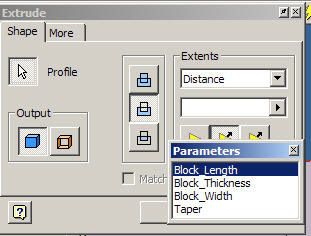 You can add as many or as few parameters as you need. 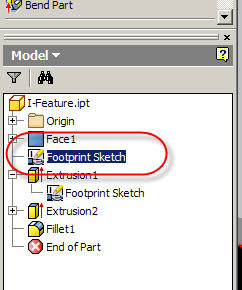 b) I used the 'Footprint Sketch' in the foot print option. 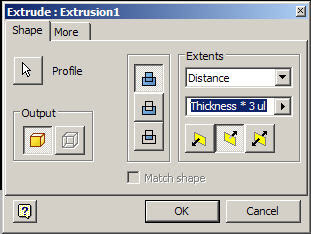 c) Make sure you add all the features you need, in this case I have two extrustions and the fillets. You can also add the features by picking them from the browser. It may be easier that way. Save the punch, and now your ready to go use your punch in your designs! 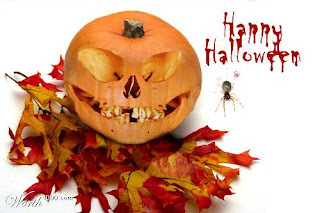 Happy Inventing! 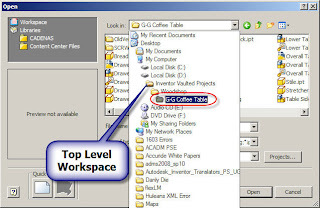 I hope everyone enjoyed the CAD Summit, and that this post is a useful extension to the event! 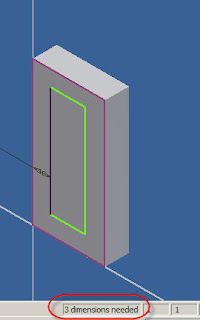 Well, for those of us who reuse AutoCAD data, there's been an interesting little glitch that's popped up. Fortunately, we do have a hotfix out for this snag. It's available from Autodesk. For those who may not have heard yet. Inventor LT was issued a bit ago. Currently it's free. 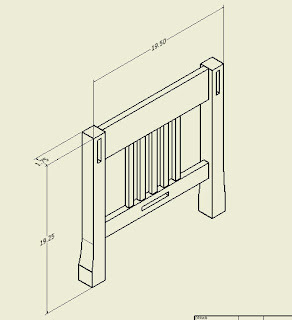 Its functionality is only composed of parts and assemblies, but for the price (did I mention free?) it can be a great translation/training/practice tool. 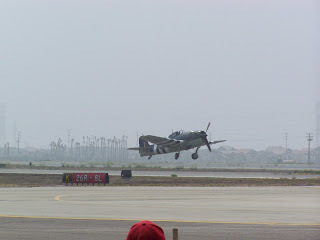 As for me, I was busy geeking out at the Chino airshow by my home in So. Cal. 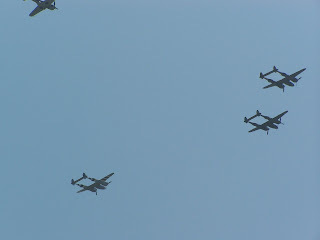 There were a ton of WWII era airplanes there, and I was in my little slice of heaven. Well here's another 'latest and greatest' 2008 option. 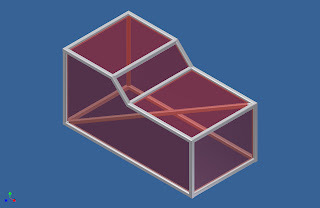 Isometric dimensions. Not the fakey ones we did in the past. 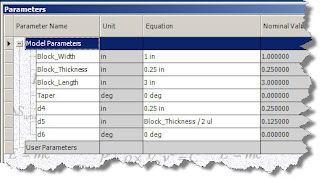 Honest to goodness true Iso dimensioning. You place them like regular dimensions, but based on the points you pick, you can get the correct orientation on the page. 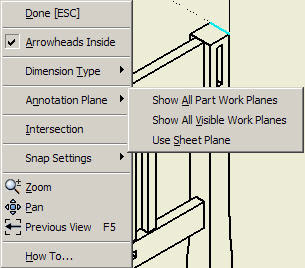 As always if you right click before you place the dimensions (when your still seeing the dimension preview), you can get additional options to use part workplanes to help 'adjust' the dimensions orientation. I'm looking forward to finishing this side project so I can really use this feature! It's been a bit since I've posted, but with the holidays, and a one week snowboarding vacation in Mammoth, it's been pretty hectic. 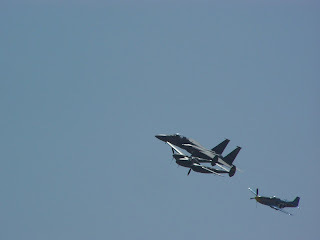 So here it is, a bit late, but my first post for 2007! We all have heard that Inventor is a 'parametric modeler', but how can that help us (other than making us sound REALLY smart in meetings)? 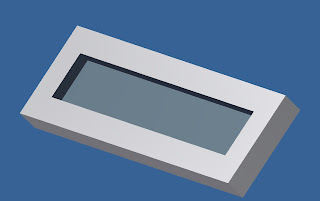 Inventor remembers all the dimensions currently used by a model, and because of that, we can use these dimensions to help make our models more intelligent. In this example, I'm going to take a very simple block, and create a pocket that will always be half the blocks thickness. The advantage of parameters is I can get the computer to remember this instead of having to remember (and risk forgetting) myself. 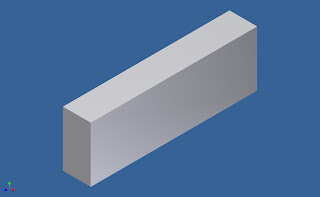 First will start with a simple, extruded rectangle, to make a brick. This part contains four parameters. 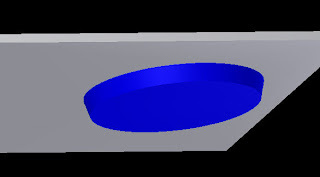 Two parameters define the dimensions of the cross section, the third defines the extrusion distance. The last one, defines the taper of the extrusion (this one doesn't have to be renamed, but I've done so just for clarification). 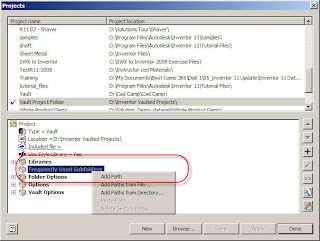 Your first step is to click on the parameters button on your panel bar. This brings up your parameters screen, where you can change the names of the parameters to something more meaningful than their defaults (d0, d1, etc). Note that I've used underscores instead of spaces. The parameters screen doesn't like 'special characters' such as %, &, etc. In the case of the parameters screen, spaces are considered special characters. 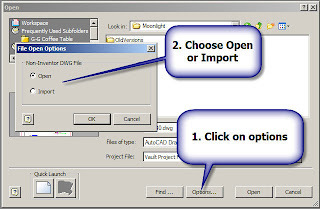 One you've finished renaming the parameters, you can create a new feature, and use these characters to help build the next feature. In this case, I'm just going to draw a pocket. However, when I go to edit a dimension, I can right click in the window, and bring up a flyout screen that says 'List Parameters'. 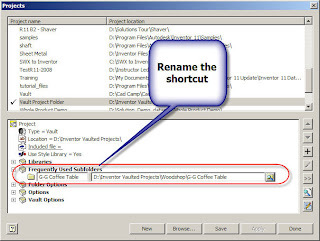 Inventor will list any parameters I've renamed (it will ignore any that I haven't renamed). 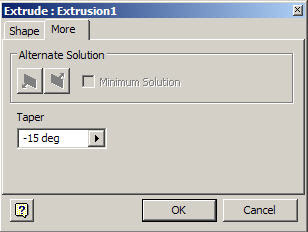 Here I've placed it in the extrusion screen, but it will work in any screen where Inventor will ask for a dimension. Once you have your dimension linked to a named parameter, you can place a mathmatical operator (in this case I'm making the pocket half the Block_Thickness). 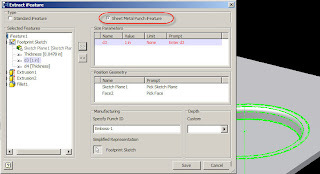 Next you can modify the Size of the part, and see that the pocket updates automatically, maintaining half the thickness. 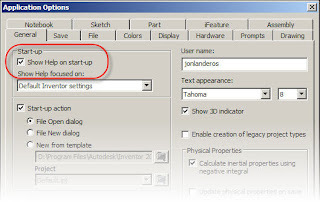 Finally, you can reopen the parameters screen, and see the new relationships that have been created by Inventor. 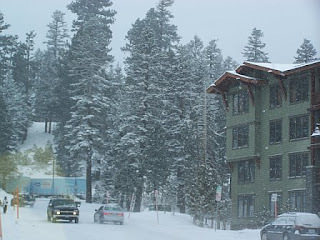 And by the way...... Mammoth was great! I already miss it!